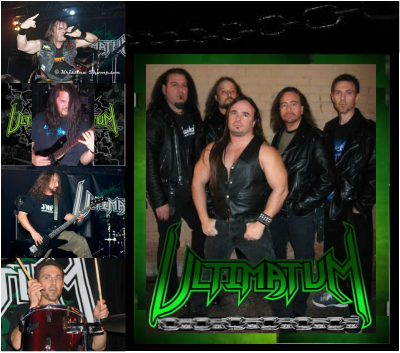 Ultimatum formed in 1992 in Albuquerque, New Mexico by musicians Robert Gutierrez, John Carroll, and Greg Dingess. The bands name comes from the ultimatum given in Joshua 24:15 which says, "But if serving the Lord seems undesirable to you, then choose for yourselves this day whom you will serve." Soon after the start of the band, bassist Steve Trujillo joined and in Jan of 1993, Vocalist Scott Waters joined helping to give the band their signature sound. In 1995 Drummer Sean Griego united with the band and helped take the band from Metal to Thrash. In 2001 bassist Tom Michaels left and was replaced by bassist Rob Whitlock. Then in 2006 Guitarist Steve Trujillo left and was replaced by guitarist Augustine Ortiz. During the recording of "Into The Pit," Drummer Sean Griego left and was replaced by drummer Alan Tuma(Moshketeers). Alan was a great addition to the band because he really helps hammer out the Thrash sound for the band. Robert Gutierrez is an amazing guitar player delivering the Thrash'n riffs to Speed Metal intensity and everything in between. He Really adds a profesional sound to the band by his unique guitar solos and shreds. 1993 demo release "Fatal Delay"
1995 demo release "Symphonic Extremities"
1996 demo release "Live Extremities"
1998 album "Puppet of Destruction"
2001 album "Mechanics of Perilous Times"
2006 album "Til the End"
2007 album "Into the Pit"
2012 album "Heart of Metal"
Gone in a second, vanished in thin air. The Lord at His appearing, His people disappear. We are sons of God, we'll meet Him in the air. Those without Him will live in despair. to take us away in the blink of an eye. Without Him you will see the horror of His wrath. Bow before Him, this chance could be your last. Ultimatum is a must have for the Thrash fan and they don't disappoint, so if your heart still beats in Metal form then you should do yourself a favor and give them a listen.